Carol Service with Wigston Band at St Mary Magdalene, 6pm. As usual the Wigston Band will be present to accompany the carols and perform their solo pieces. Mince pie and sherry to get you in the Christmas spirit. Christmas coffee morning in the village hall from 9.30am to 12noon on Saturday 24th November 2018, with yummy refreshments including breakfast baps. 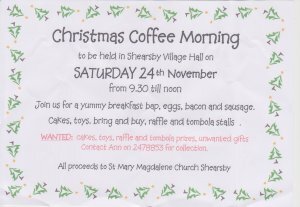 WANTED: cakes, toys, raffle and tombola prizes, unwanted gifts. Contact Ann on 247 8853 for collection. Monday 12th November, Rev'd Liz visiting the home of Sue Timms at 2pm. All welcome. Details of the Harvest Festival on Sunday 30th September and also of the Harvest Supper on Monday 1st October, 2018. Poster for Afternoon tea at The Chandlers, September 2018. Below are thank you notes for the amounts collected for the Foodbank.Shearsby reached a total of 110kilos in 2018.Well done to all who contributed. I would like to thank you on behalf of the Foodbank for the 15 kilos of food collected by your Church during December. I would like to thank you on behalf of the Foodbank for the 23 kilos of food collected by your Church during October. I would like to thank you on behalf of the Foodbank for the 16 kilos of food collected by Shearsby Church during September. 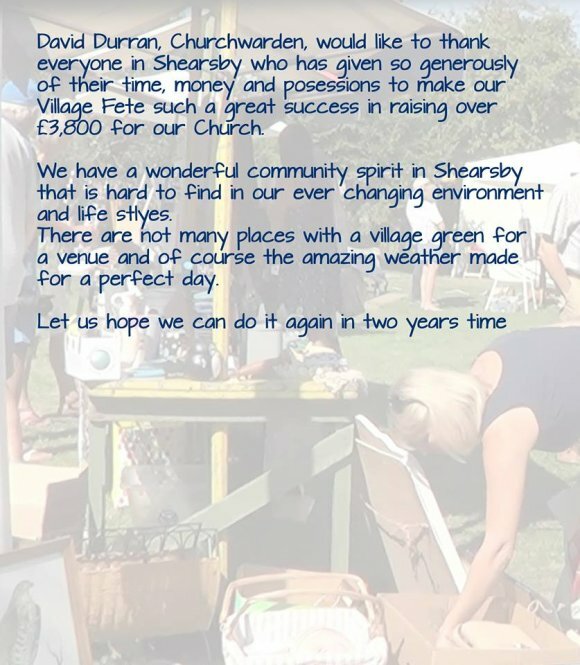 I would like to thank you on behalf of the Foodbank for the 5 kilos of food collected by Shearsby Church during August. I would like to thank you on behalf of the Foodbank for the 16 kilos of food collected by your Church during July. I would like to thank you on behalf of the Foodbank for the 21 kilos of food collected by Shearsby Church during May. I would like to thank you on behalf of the Foodbank for the 5 kilos of food collected by Shearsby Church during March. I would like to thank you on behalf of the Foodbank for the 9 kilos of food collected by Shearsby Church during February. Regards Barry McHugh, Lutterworth & Villages Foodbank. 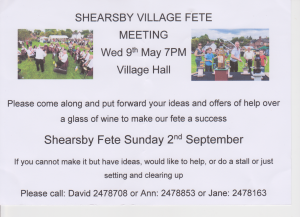 Fete meeting on Wednesday 9th May at 7 pm in village hall. For the committee, stall holders, helpers and anyone else wishing to get involved. Please note the Church service at St Mary Magdalene's on Tuesday 27th March at 7pm. It is a service for Healing. Please refer to The Hexagon for March 2018 for full details of Church services for Easter in the area. See near the foot of the page. The village hall was reeling late into the night with the sound of Gaelic music provided by the Mee Ceilidh Band. The event raised over £300 which was divided between Loros, and Mary Magdalene Church. Many thanks to Ann and Andy for organising this great event. 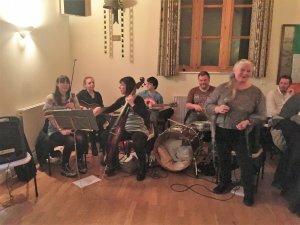 St Patrick's Day Ceilidh held on the 17th March 2018 in the village hall. At the Promises Auction Jean Chapman promised to hold a Danceathon to raise money for the Church funds. 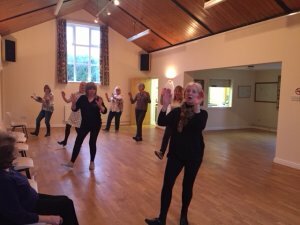 It took place on 14th February 2018 in the village hall. Ladies from the village took part, dancing almost continuously for a long time. There was however a cake break to scoff cakes made by Ann and Sue. A lot of fun was had and the great total of £665 reached. The Shearsby page and the Church date and time page from The Hexagon. The Shearsby page and the Church date and time page from The Hexagon, for May 2018.